Let’s face it- I’m obsessed with the color pink. Before we knew Addison was going to be a girl, I told everyone, “If the baby is a girl- everything is going to be pink, pink, and PINK!” I just can’t help it. Since finding out that our sweet baby IS a girl, I’ve found so many great Instagram shops and just oohed and ahhed over all the adorable baby things. It’s my birthday this Thursday, and to kick off my birthday week I thought, why not share all the goodies that I love for Addison with all of you? So, I teamed up with 5 of my favorite Instagram shops for The Vintage Modern Wife All Things Pink Giveaway! Scroll down to the bottom to enter! Freshly Picked is one of those companies that has just taken OFF lately on Instagram. Although their moccasins are a little on the more costly side, they’re worth every single penny. The quality of their shoes goes above and beyond those I’ve seen from any other moccasin company, and I love the variety of leather colors they offer. Not only do they offer moccasins for children, they recently came out with their carryall bags made from the same leather as their moccasins. SO. Freaking. Cute. I can’t wait to put these Neon Pink Freshly Picked Moccasins on Addison’s little feet! SugarPlum Lane Baby is another favorite shop of mine, and I can’t get over this Summer Swaddling Blanket and matching headband set. The blanket is really soft, big enough for swaddling Addison in really good, and has these cute gold glitter dots that don’t come off when you wash the blanket. The glitter not coming off was a BIG thing for me- because I would never be able to forgive myself if she got glitter in her eyes. I can’t wait until she’s born so we can get some professional pictures of Addison all swaddled up. Sara Ellie Bows has the most adorable bow headbands I’ve ever seen. Y’all know I have a huge collection of flower headbands, but Sara Ellie Bows has bow headbands that I just die for. I asked sweet Sara (the owner) if she could make me a trio of her medium sized bows in various shades of pink, and asked her to “surprise me” when it came to the elastic bands. I was SO surprised at how perfect these headbands turned out, and immediately put them on Addison’s DIY baby headband holder. We already had a mini gold bow headband from Sara Ellie Bows, so I’m excited to add these to our collection. I had the privilege of meeting The Printed Palette owner, Alissa, at Blissdom over a year ago and she’s such a sweetheart! Not only does she have a successful shop online, but she has a storefront location in Carlsbad, California that is so freaking cute. 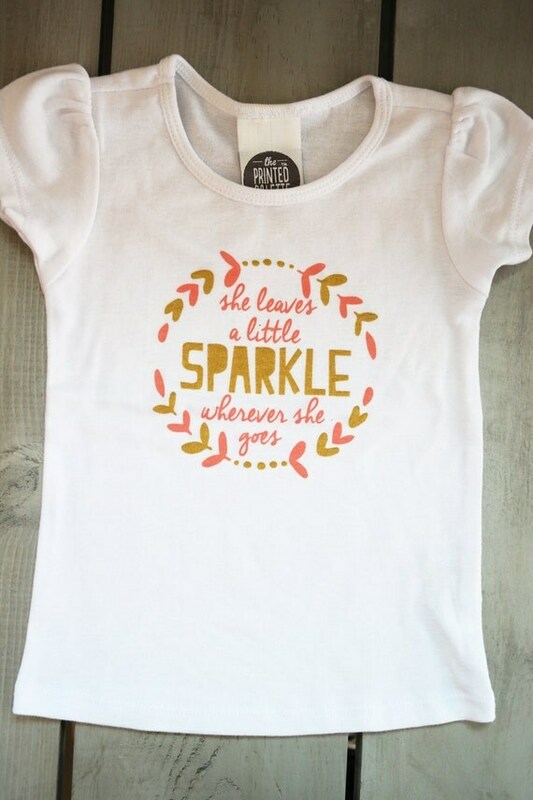 Although this She Leaves A Little Sparkle Wherever She Goes Puff Sleeve Baby Tee is more of a coral than pink, I can’t help but know that coral looks good on practically every skin tone, and I can just picture Addison in this tee with little shorts for the springtime. The Tulle Box carries these adorable door signs for moms, and the The New Mom Baby Sleeping Doorbell Sign is a must have for tired mamas everywhere! The dial options have “Shhh! Baby Sleeping,” “Knock Softly,” and “Do Not Disturb” perfect for those prone to guests, mail deliveries, or solicitors. I absolutely love this because I wont have to worry about someone waking up Addison during nap time when I’m on maternity leave, and I can put the “knock softly” option up whenever I know friends or family will be coming to drop by. Oh my gosh! I would totally go crazy pink if we had a girl too! This is the cutest giveaway there ever was!! Is it wrong that I don’t want to share this with anyone so I can win all the prizes???? Ha! OMG I love those hot pink moccs! such a great giveaway! my friend is about to have a baby girl any day now! What an amazing giveaway!! So many pretty things for a little girl! Oooh if I was a mommy I would LOVE to win this stuff! My favorite is the shirt. Too cute. OMG so stinking cute. Love the pink and obsessed wit that cute shirt. So adorable!!! I love those door signs!! I love those moccasins! We have gone pink crazy since having our little girl too. So fun 🙂 Boys are fun too, but I’m enjoying all the pink! YES. Oh my darling, love it all! SUCH CUTE STUFF! Eeeek! I hope I win! Those shoes are adorable! Love all the pink stuff! I love all the pink cuteness. I love Freshly Picked! Ever since I found her on Insta I am obsessed. When I have kids, I can’t way to buy all of the colors! This is such a cute giveaway! Who doesn’t love pink?! Cute giveaway! Love the little shoes. This is such a cute giveaway. I love the pic of you holding the baby shoes! That baby tee is adorable! Like seriously, I’m dying! That sparkle shirt is too cute. I’d love that and the little shoes for my daughter. Cam | Bibs and Baubles recently posted…Not True, Your Honor! Ah! I love all the pink! What a fun giveaway! This is seriously the cutest giveaway I have ever seen and I would love to finally own a pair of adorable FP moccs! Hello! I am most excited about the headband with matching blanket. The print is absolutely gorgeous! Thank-you for this fun, cute, & exciting giveaway! Those little moccasins are adorable!